Messenger VS Conventional Referral Marketing: Who wins? We have 2 brand new webinars! March 14, 2019 - No Comments! Running an agency is difficult. Running a successful one, even more difficult. What’s also very true is that agencies have on their ranks some of the most efficient marketing minds in the world. Coming from an agency ourselves, Savvas and I try to keep a close eye on what’s going on in the agency terrain. Since we launched Messenger Bot Giveaways by Viral Loops we are in a constant search for people that really know how to use Messenger bots. Every once in a while, we come across a brilliant mind and- surprise, surprise, they either work for or own an agency. 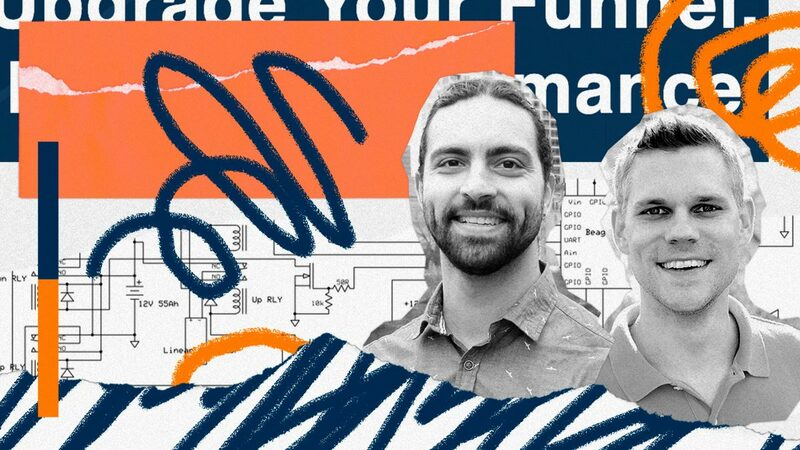 After our insightful interviews with Arri Bagah and Hunter McKinley, we got in touch with the amazing Samir ElKamouny & Matt Lampkin from Fetch & Funnel. We scheduled the interview, and Savvas had an amazing conversation with them. Here’s what they had to share with us. What is Fetch & Funnel? Fetch & Funnel is an acquisition agency. We specialize in helping e-commerce brands to scale sales and revenue-primarily through social advertising and sales funnels. We’ve also been designing, testing and integrating Messenger as a channel into our social strategies for almost two years now. We found Facebook Messenger to be one of the best ways for a brand to acquire customers, because it's an incredibly powerful way to solve problems throughout your marketing funnel. How did you decide to integrate messenger marketing into your clients' strategy? We still do Facebook advertising the way we were doing it before Messenger, but the second we saw that you could build a subscriber base on Messenger, our first thought was that this is going to be the next biggest marketing channel. It was just super obvious, all we had to do was to figure out how to utilize it. What are the best practices? What are the tactics and strategies that will work? Then we just ran from there. Combining Email with Messenger Marketing. Email’s not dead. It’s just another way to market your audience. You can write a long paragraph in an email, but you can't write a long paragraph in Messenger. They're two different channels, and two channels are better than one. You can get the same message in front of your audience in more than one place. Messenger is a little bit less intrusive, and combining the two is a really, really great way to to get email addresses for a much lower cost. You can get email address directly in Messenger. For example, we found out that the most inexpensive way to gather registrations for a webinar was to ran a Facebook ad to a messenger bot that asks for their email address and it automatically registered them to a webinar. It was the lowest cost for webinar registrations, plus we could get people in both email and Messenger channels and then play to the strengths of each. From an email list to Messenger. If a client already has an email list, there’s an opportunity to transfer people to Messenger and start to market to them according to the needs of the platform. It seems like it should be easy to ask people to subscribe to your Messenger list. Just send an email to everyone and ask them to sign up. Right? The problem with that is there's no incentive, there's no bait and you're also not taking advantage of segmentation. If you have a large email list and you're a good email marketer, then you've already done some advanced segmentation. Therefore, you should be segmenting your Messenger list the same way and then adapting your content to the medium. Don't send the same message to both prospects and customers. Do customize your messages for each audience and then be sure to add tremendous value that appeals to each audience. When speaking to prospects you should say, “hey, here's a link to get answers to our most frequently asked questions" OR, "Let us help you customize the perfect product for you”. Keep it simple when trying to add value. A simple coupon can go a long way. Adding value, giving some sort of bait to get them to click and subscribe on Messenger, is definitely be the most important thing. After that, you should segment them as well, which is really easy to do. You could be subscribing people to different bots or to a different sequence, and once they're in you can nurture. If your email list is not segmented, this is the perfect opportunity to get them into Messenger, and ask a couple qualifying questions and segment your audiences from there. We found that on an email list it's pretty common that, unless somebody is a paying customer, you don't have much information about them, to begin with. You don't really know their preferences. You don't know what their interests are. If you sell different products or you offer different services, or have different types of content you're probably not exactly sure how to match up potential customers with the right offers. You don’t know why they signed up in the first place, and what information or material resonates with them. In Messenger, you can just go and ask them, so that they'll tell you what they're most interested in. At this point you'll able to segment and personalize right, for extremely relevant marketing. A lot of people (especially in eCommerce) segment their Messenger list by having a menu inside Messenger, or they have a link somewhere on their website to get product suggestions. It's something like a quiz asking their users some questions in order to suggest them the best products for them. This is a great way to gather, with two or three questions, data about your subscribers and segment them. Asking the right questions to segment your Messenger list. You need to ask your subscribers questions, and then you can add a tag to each answer they give you. I think the more tagging you do, the better. At least up to a certain point. If you've got a thousand tags that you're never going to take advantage of, that sort of doesn't help. If you do a product recommendation based off of either their preferences or their interests, it's really a hundred times more powerful than just having a follow-up message. You can offer a discount on their preferred product, or give info for a new version of that product. With a simple question about their preferences, you have now segmented that person and by their interest and now you can literally offer them the exact product that they want. Ask people questions that show your their interests/preferences/tastes. How often should we broadcast to our Messenger subscribers? There’s no golden rule in that. It really depends on the brand. I would say the biggest thing is really keeping an eye on metrics like your Open and Click-Through Rates. If you're sending a message every single day and you're not adding that much value, you will immediately see those phenomenal 80% open rates, and 30% click-through rates start to decline. The most important thing is adding value. Maybe you're nurturing someone about what your mission is, or why they should be interested in working with you, or about why your products are the best in the market, but that's still sort of salesy. So you should add some value to their life by, for example, sending them a blog post that is slightly related to your business, but not trying to sell them. If all you're trying to do is sell someone over and over again, that's really where you're going to get the unsubscribes, and a huge decline in Open and Click-Through rates. Don't forget to make sure it's easy to unsubscribe. If you don’t, people will go and mark you as spam, and if that happens too often, Facebook will suspend you from being able to send broadcasts or messages. It's super important to make that explicitly clear. We find with most of our clients, broadcasting once a week is great. If we're adding value and getting great results we'll increase frequency. Another thing to keep in mind is that if you built sequences and you have a bunch of people in them, make sure that you're not sending a broadcast super-close to when you may have scheduled a sequence to be sent to them. Just make sure that you're not imposing on anybody at all. It's important to create a schedule for your broadcasts and your publishing- just like you might create a monthly email calendar so that you adapt at the frequency of sending broadcasts based upon the data that comes back. A great example of this is one of our clients, they're called the Gadget Flow and they're one of the largest platforms of essentially promoting different products and different gadgets. They don't directly sell them, but they have thousands and thousands of products on websites like Pinterest. We quickly built them a large subscriber list, and we started sending broadcasts out. We were sending them very frequently, maybe two or three times a week. Then we noticed that the Open rates Click-Through rates were really steadily declining and we couldn't figure out why. And so we realized that we weren't speaking to our audience in the correct way. We went and ask them a bunch of different questions about exactly which categories they're interested in. Now we send out a blast every Friday and that is specifically tailored to only tell them about the coolest gadgets in the categories that they specified that theywant to know about. That kept the Open the Click-Through Rates extremely consistent. Successful Messenger flows for e-Commerce stores. Giveaways are extremely powerful if you keep it consistent with your product offering. They are extremely powerful and you can do some really interesting things woth them, like running a Facebook ad about the giveaway and asking people to enter to win. You can definitely have them to do something extra in order to register; e.g. follow you on Instagram, give you their email address etc. Then you can ask them one or two qualifying questions, like which product they're interested in. That way, you’ll be able to segment them. Now, the secret is everybody's a runner-up. Then you give them a coupon code to the exact item that they said they’re interested in. This works extremely well, but you can't do it all the time, because otherwise, people are going to catch on if you're not segmenting only to new people. So you can also build some evergreen versions of this; it could be a super similar model where it's not really a giveaway but it's a quiz or a test or whatever you want to do. You can gamify it and make it really fun and allow them to win. We've done this for some really big brands and it works really really well. Everybody loves to play a game, and it's quick and easy to just click the buttons in Messenger. Plus by providing them that coupon code, they feel like they won something. It definitely works really really well, but again- it’s super important to ask them what they're interested in and then give them a coupon code just on that item, or maybe put together a bundle that includes that item. We've had really really great success with that as well. This is a great way to increase your average order value, but also give them the thing that they were interested in at a discount. You can do this in a lot of different ways. You could do a giveaway for a product launch. We work a lot with crowdfunding campaigns like Kickstarter and IndieGoGo, and you can use this tactic to build a massive list before you launch your crowdfunding campaign. Boulding the pre-campaign list building is probably more important than the actual campaign itself because it determines how much success you're going to have when you launch your Kickstarter or Indiegogo. Giveaways are a great way to build your list, but don’t stop there...give everybody a coupon code or a special offer the minute you launch. List building and giveaways are also a powerful way to maximize Black Friday. Your competitors are going to spend their advertising dollars in a very short window, it’s uber-competitive. If you have an internal support team within Facebook, or you work with an agency like us, where you can tell Facebook “hey I'm planning to spend this much make sure I have enough ad buying space.”, If you don't have that connection or partner manager, you probably won't even be able to spend your budget. So here's what you can do instead. In the weeks before it gets super competitive, run a giveaway on Viral Loops and build a massive list for cheap. 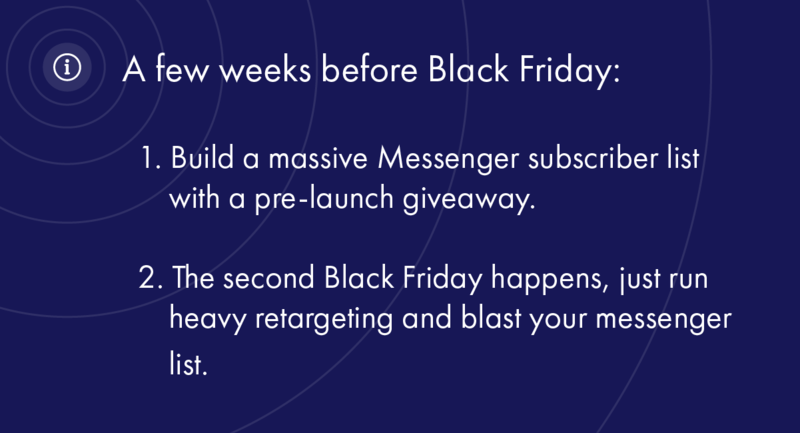 Even if you're losing money, it's totally okay because the second Black Friday happens, just run heavy retargeting and blast your messenger list for free. That worked extremely well for us this past year. It’s also a lot of fun because the sales come flying in after a well-coordinated Messenger blast. It’s also not like your new subscribers aren’t going to hear from you for two or three weeks. Nurture them along the way. It's incredibly powerful if you can ask a consumer what it is that they're actually interested in. The power of Messenger is that your message gets through. You're not going into the Gmail promotions tab with every other competitor. Your message will be read, and if there's value you'll see fantastic results. The power of Messenger is that your message gets through. And as long as you're able to sort of qualify upfront and determine what users are actually interested in -- to send out the right offer at the right time, you don't have to rely on advertising to get in front of that person to get that sale. You could do it for any sort of product launch, any sort of giveaway, promotion, or offer. Something that I've seen from one of our clients is that they run a wishlist giveaway. So, they say that five people will win their wish list up to $300 each, and they ask people on messenger to add their favorite products, so somehow to create a wish list and if they win they will get these products. So everybody that joins the giveaway completes the wish list. Basically, they built and segmented their list at the same time. That way they knew what products are for which people and start selling according to the segmentation. Fetch & Funnel’s favorite chatbot platforms. We're sort of platform agnostic, so I would say the top three that we use are ChatFuel, Mobile Monkey and Manychat. I think each one of them has some different Pros. There are other Bots that can be very tool specific. Like there's a lot of great Shopify cart abandonmet plugins, but again, they solve one specific problem. Manychat has a lot of different uses, like website pop-ups, scan codes, comment tools, etc. Mobile Monkey allows split testing, which is nice because you can set up some conversions inside the platform and track them. It's almost like setting up goals in Google Analytics. You set a goal inside Mobile Monkey and you can track those conversions. ChatFuel has a very open JSON API where you can send data back and forth between virtually anything. It's a great way to run abandoned cart sequences, for example. We will run a Facebook ad to “cart abandoners”, get them into a messenger bot, offer them some sort of value to make that purchase, and we can grab their email address associate their Messenger ID and their email. We send the data to CRM via Zapier. Then when a purchase is made on the website, we send a broadcast through the API back to ChatFuel. After this happens we exclude them from the abandoned cart sequence and they automatically get moved over to the customer list. Another thing that I think is really, really important- that most people overlook, is reporting. ChatFuel has pretty decent reporting. Manychat also has decent reporting. But you can get way more advanced by utilizing a tool like Dashbot. With Dashbot you can track what your top messages are, as well as the performance of every step in your bot funnel. Platform selection comes down what you’re trying to accomplish. We've even got one client using three different platforms. Testing your campaigns is crucial. You can't just try one thing and then give up on it if it doesn't really work well. You really have to test different messages and different outcomes. If you made it sort of long, make it simpler. Do different testing of different bots, because it's just like a website. It's just like a funnel. It's just like anything, really in marketing. You will eventually find one that will really unlock a high ROI, but it might not be the first one, and it might not be the one that you thought was the clear winner, or the best one, or the most unique one. For example, we did a huge giveaway with a client. They were giving away three $700 phones. You would think that everyone's going to sign up for this thing immediately, but it was a phone that no one had ever heard of. So we told the client: “hey if you're giving away three of these phones, it would be better if we just gave away one iPad or are two Samsung Galaxy phones or whatever because people will recognize that and be more likely to sign up”. Even though they were giving these super awesome expensive phones, people din't care what the specs are if they don't really recognize the brand. It’s definitely important to test different things. Don't forget to spread the word. Something else that we see quite a lot is that people launch their campaigns and then they don't spend time on letting their people know about it. The campaign doesn't perform, and they are left wondering what went wrong, and why their ROI is negative. They expect to see results based on the fact that they’re paying for it. You don't really have to “shout” to get people's attention. Build a unique experience and let people know about it. You can look at Tony Robbins’ bot, Timothy Sykes’ bot. You can look at Gadget Flows’ bot, or even Product Hunt’s bot, and see that right when you enter it's a unique experience and you get to mess around with it for a few minutes. It provides value, and It's asking questions. You can’t lose when you create an experience like that. You should link your bot with all of your digital assets. Put it on your website, in your email signatures, on your Instagram account. Build that subscriber base, because it is never going to be as cheap as it is today to build your Messenger list. And so it's so important to do it as fast as possible because, in two years from now, you're just going to totally regret that you didn't do it. All your competitors are going to be doing it, and you don't want to be late in the game when you can really be so early right now. January 29, 2019 - No Comments! Marketing via referral programs is nothing new. In fact, before referral marketing had a name it was simply called word-of-mouth marketing. If someone liked a product, service, film, or piece of music, typically they would tell their friends who in turn would tell their friends and… well, you get the picture. The same holds true today; the only difference is that digital marketing has opened up the possibilities to allow people more channels than ever in which to disseminate their recommendations, reviews, gripes, etc. Basically what this means is that if you give your customers a valuable experience, many will turn into brand ambassadors and that enthusiasm will gain momentum as they rave to their friends. Take this stat from Market Force, for example. The purchase decisions of 81% of U.S. online consumers are influenced by their friends’ social media posts. This is a new reality—it’s how Millennials prefer to shop in the digital age. So how do you take advantage of this and maximize the potential of your customers doing the heavy lifting of spreading the word for you? Implement a referral program, of course. Incentivize your potential customers to put the word out. Here we list a few examples of brands that successfully incorporated referral programs into their marketing scheme. Hopefully, they will inspire you. G Suite is a comprehensive collection of productivity, collaboration, and cloud computing tools designed and released by Google in 2006. This suite consists of a number of tools that are now all but indispensable in this day and age. They include Google Drive, Docs, Hangouts, Calendar, Google+, sheets, slides, forms, and of course Gmail. But despite G Suite enjoying the branding of the most popular search engine in the world, they still had to market these tools back in 2006. In order to get people talking about the suite, they implemented a referral program that incentivized new users with cash for each person that signed up using the program participant’s link. The program worked thusly: those who wanted to spread the word were given a referral link and coupon codes to share to help folks get started with G Suite. And for each new user that signed up and met the referral terms, those who spread the word got $15. So, just like in the B2C world, making monetary rewards/discounts the cornerstone of your referral marketing strategy is always going to bear fruit. 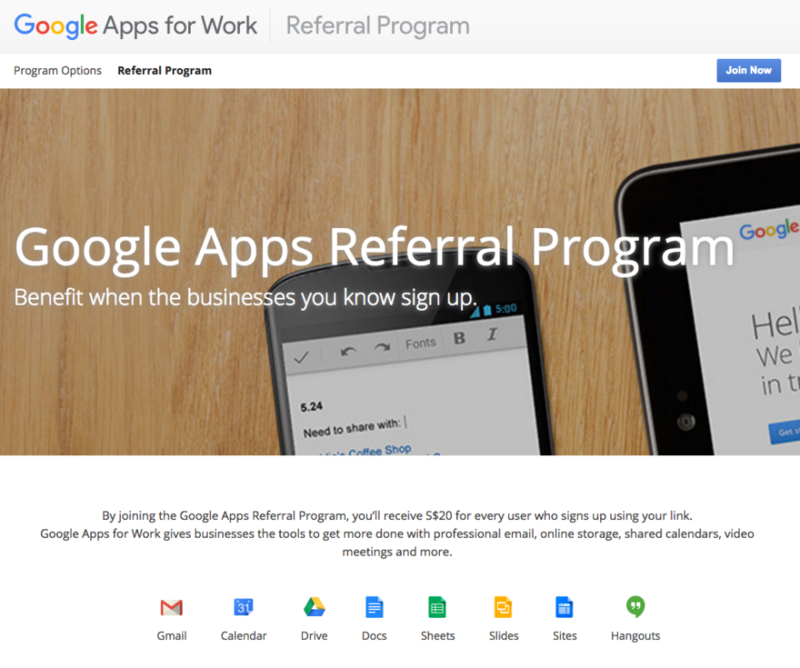 Just ask Google—as of 2017 that referral program helped grow the suite to include three million paying businesses and 70 million G Suite for Education users. The number two example on the list is/was Carpathia, a Virginia-based business that focused on cloud services. They decided to go all out for their referral program and recruit third parties as referral partners. In their referral marketing ad, they used bold type, engaging color schemes and an easy signup process (just three steps). The first step was to join the referral program online. Then participants received access to tools and materials like white papers and case studies, to help identify more potential customers. Upon referring new customers, the participants were then given a commission. This tactic worked like a dream, as Carpathia added hundreds of new major clients, which in turn got the attention of QTS Realty Trust. The result is that QTS, another data services provider, merged with Carpathia in a $326 million deal. This is a full-service IT company that focuses primarily on small and medium-sized business throughout Philadelphia and the surrounding region. They not only invested in referral marketing but they made it the lynchpin of their marketing strategy. Like the above businesses, IT Solutions, Inc. also makes the signup process a quick and easy one (just a few info fields on a single page). Their program works because it is straightforward, simple, and highly enticing. 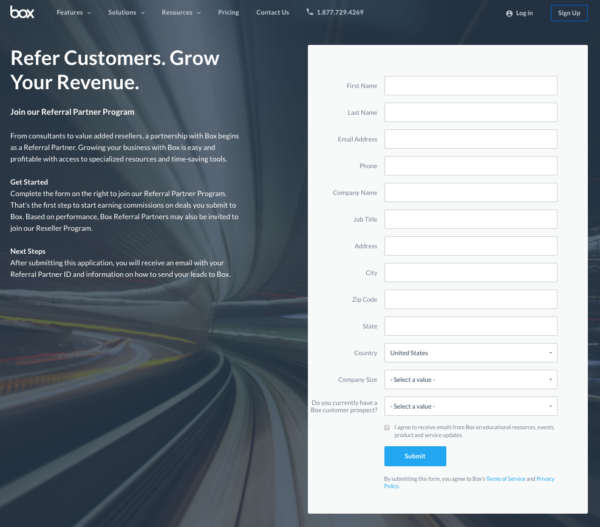 The company is upfront about wanting recommendations, and they flat-out state they’ll reward any referral partner $1,000 in IT Solutions, Inc.’s services for any new signup. Likewise, the company that referral company signs up will also get $1,000 worth of services. As an added personal incentive, the referral partner also gets an Amazon gift card worth $100. The signup process is simple, too. All the participant needs to do is enter his or her contact info as well as the contact info of the referred company. As a result, the IT Solutions Inc. has been growing like crazy and racking up the awards. They’re in the top 1% of all Microsoft partners and were one of Inc. 5000’s fastest growing companies for nine straight years running. Blackbaud is a seller of software and services provider that made their mark in the fundraising field and working with non-profit organizations. Their brand is all about “giving back” and they’ve carried this message over to their referral program as well. To become a Blackbaud Champion involves making connections via their Champions Hub network at which time you’ll earn rewards points. They incentivize users with a deep rewards catalog for making these connections, and points can be redeemed for everything from product discounts to event invites to iPads to gift cards and more. BlackBaud is a great example of offering diverse rewards to all of their participants. Like with IT Solutions, Inc., all that’s required to sign up is to fill out two simple text fields on their referral webpage. It’s paying off well for Blackbaud, too. Not only are they partners with Microsoft, but the two are expanding that partnership with the express goal of transforming the non-profit sector. Seems it pays dividends to spread the word. Who doesn’t like free hosted email? Zoho, the email hosting service, was keenly aware of this when they started their referral program back in 2013. For simply signing up new customers, existing ones could get up to 20 free users in their hosted email plan. Moreover, the business they referred could also get up to 20 new users. To do this, they set up a referral webpage and participants were welcome to sign up. They made the process as easy as possible, adding clickable buttons that could invite participants to “send an invite to a friend,” and then simply requesting a contact email and name. Nothing more. The strategy was simple but effective: appeal to small and medium-sized business who may not want to spend extra cash each time they hire a new employee. Zoho made their hosted mail service attractive to these businesses for exactly that reason—now they could add up to 20 new employees on their email accounts without spending another dime. The strategy seems to have paid off, because as of 2017, Zoho has signed up over 10 million business accounts. 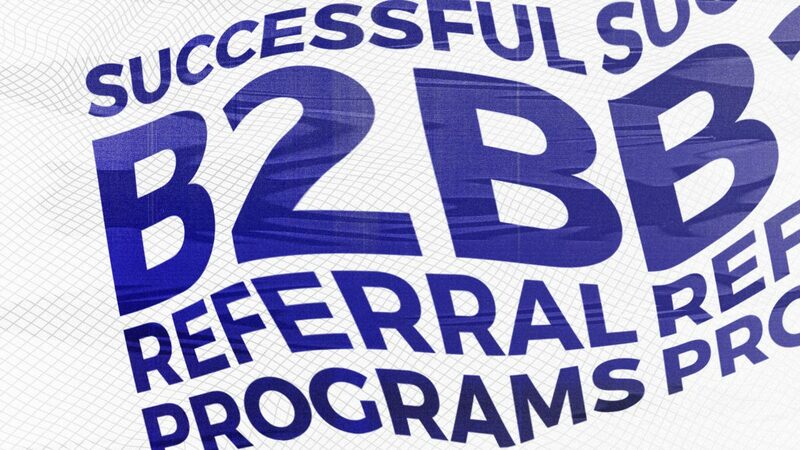 Hopefully, the above examples serve to illustrate how the momentum of signups to a B2B company can increase with an enticing referral program. Do it right, and you’ll eliminate the need for superfluous sales and marketing tactics and save money on advertising. Just remember the fundamentals: always aspire to provide the best customer service possible. That is the key to getting customers eager to spread the word about your company and make your referral initiative a success. July 3, 2018 - No Comments! Remember when people first started using “google” as a verb? It’s every startup’s dream—beyond making lots and lots of money, of course. It’s the arrival. The moment when there’s a universal acceptance that your company as the go-to provider of a product or service…so much so, that people now use your brand as generic noun or verb. Pass the Kleenex. Xerox a copy. Relax in the jacuzzi. Enjoy fish and chips with a coke. And now...paying to stay overnight in a neighborhood flat or borrowing a local family’s rollaway bed while you travel...you’re airbnbing. So how did this scrappy, born-out-of-necessity, startup make their claim to fame? It was its well-timed and well-implemented referral marketing program. Let’s talk about how they did it. So you’ve got a new product, but the world is not knocking down your door to download your app or use your service? Not everyone wants to be an early adopter, and that was certainly the case for Airbnb. What’s more, when Airbnb launched their service model, they were met with concerns—travels and hosts alike worried if they could trust a stranger. Jumping that hurdle began with this fundamental insight: a whopping 92 percent of people say that they find recommendations from a peer more compelling than advertising. We know how powerful word-of-mouth advertising is when used to sell any product or service. 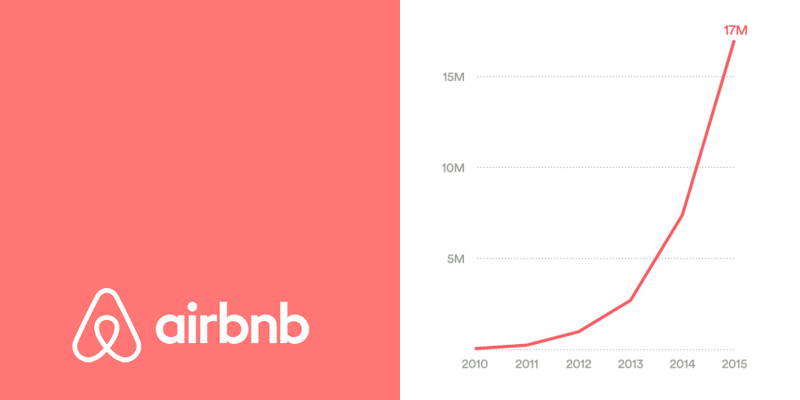 But for the services Airbnb offers, the power of a word-of-mouth was be even more critical for accelerating growth. By building a refer-a-friend-like program that gave experienced customers the mic—along with background checks and a hefty insurance policy—Airbnb could reduce (if not eliminate) those fears, making travelers and their hosts more travel-ready. Current customers became the trusted brand advocates new customers really want and need to hear from. And the referral approach is just that...personal. When starting a referral program, everyone has the same question: What will entice people to sign on, sign up and most importantly, to refer others to do the same? For Airbnb, the answer was simple. They wanted to build a database of world travelers, ready to rent apartments, rooms, and homes the around the globe. So the home-sharing company incentivized would-be travelers offering travel credits—$25 when a referred friend rented from Airbnb and $75 when a referred friend listed his or her property for rent on the site. It’s up to the traveler to decide whether to spend these credits as they are earned, or save them up and use all at once. Sounds really awesome to a traveler, doesn’t it? For Airbnb, however, the approach was a little risky. To offer these travel incentives, Airbnb had to open up their wallet and pay some cold-hard-cash. When a traveler got a credit for accommodations, Airbnb still had to pay the host. 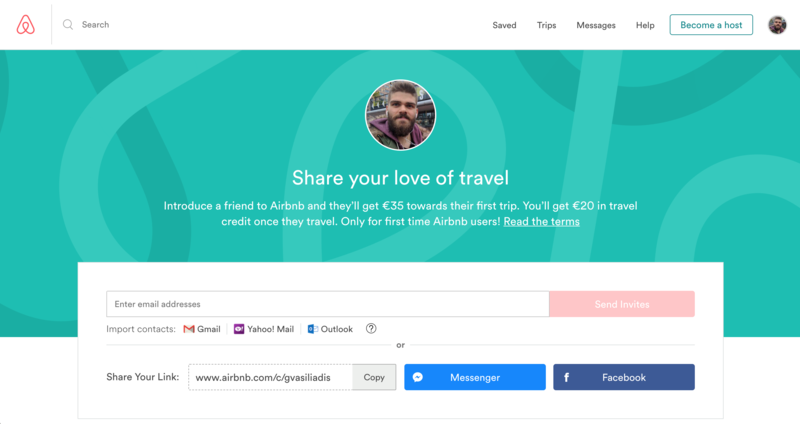 With this double-sided reward model, Airbnb was (and still is) putting their money where their mouth is betting that once customers try their service, they’ll return. Otherwise, Airbnb is just tossing money out the window. If you’re confident in your product or service model — as Airbnb was — taking this sort risk just might be worth it, as the reward can be so sweet. Before you launch a referral program, you need to set a realistic goal and identify metrics that you’ll use to measure success or failure. Airbnb made sure they were aiming at a reasonable target by first running a closed beta test of its referral program. To start, Airbnb offers the travel credit incentives for referral only to their existing 2,161 existing members. The result? 2,107 new members joined, this nearly 1:1 growth ratio was a clear indication that this program would be a likely success. They looked at their growth in these areas historically (before the referral program) to see what they could reasonably expect from this program. The results determined that the Airbnb team could expect their numbers in these categories to increase anywhere from 20 to 90 times their current standings. 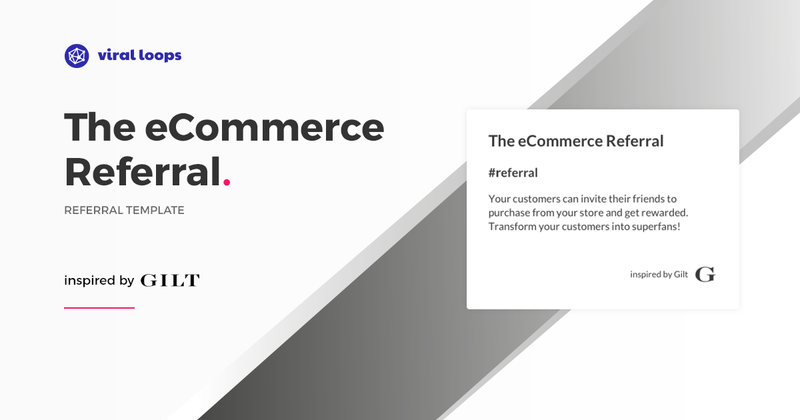 This range provided a way to decide if the live referral program was successful in their attempts at bolstering their business through referral. 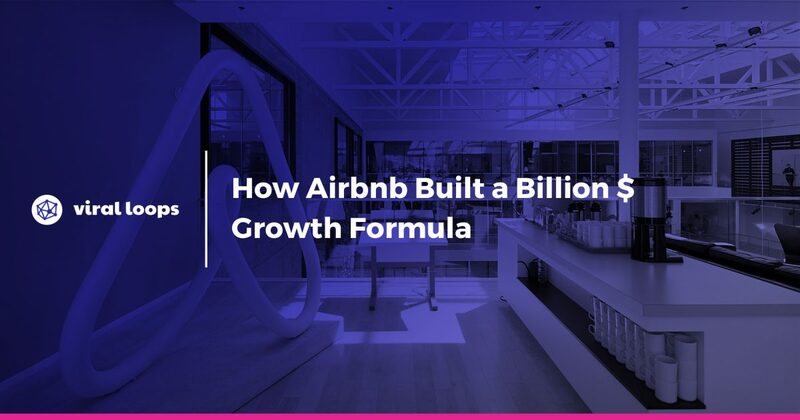 To see how their actual performance measured against their projection, Airbnb tracked growth every step, A/B testing new content and landing pages and using customized dashboards to make the information accessible. And Airbnbers surely delighted in watching the numbers climb, as we know now exactly how successful this effort proved to be. Ultimately, what Airbnb is trying to do is build a community of travel-loving followers. And their referral program is only one of the ways they are making “airbnbing” a choice preferable to booking some boring old hotel room. 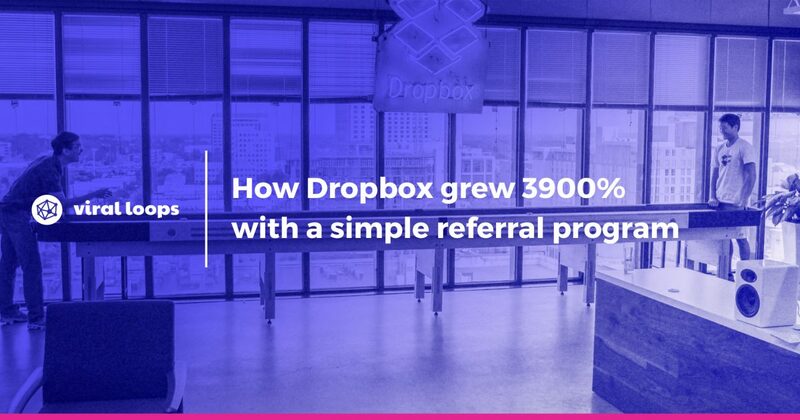 Dropbox grew 3900% with a simple referral program. Here’s how! This is the 3rd addition to the "How the hell did they pull this" series- it’s not official, I just like to name things. 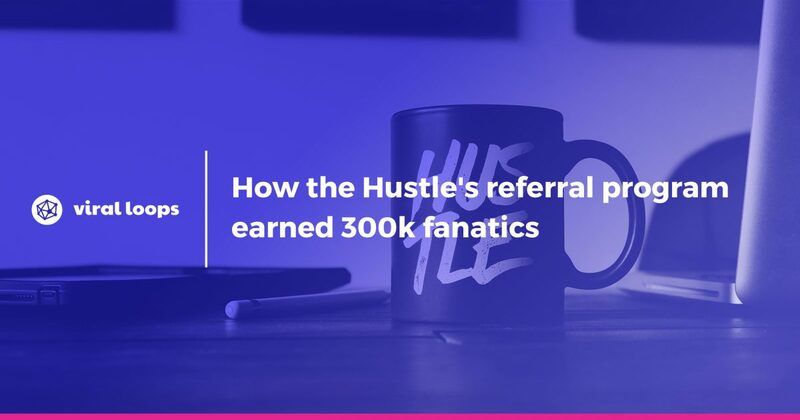 How the Hustle’s milestone referral program earned them 300k fanatics. 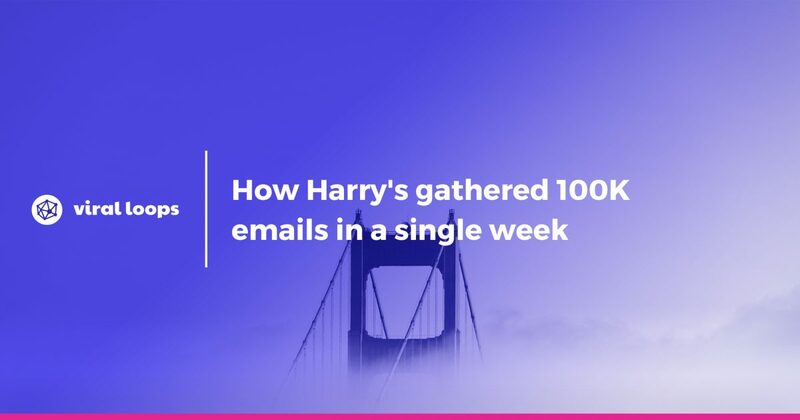 How Harry’s gathered 100K emails in a single week with a milestone referral program. It’s already a cliche to try to convince you if referral programs work or not (of course they do) and why, so instead, this article is solely focused on the how. 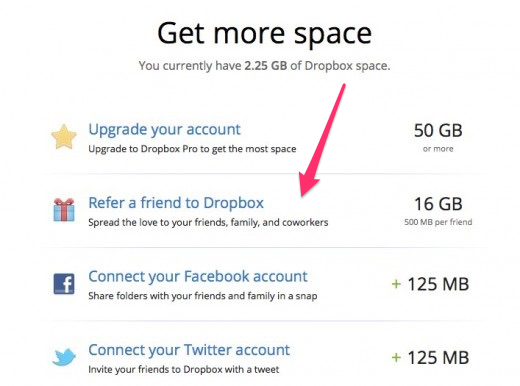 Dropbox’s referral program is possibly one of the most famous cases of referral marketing. Almost a decade later, it’s still used in numerous case studies showcasing how referral programs can contribute to a company’s growth engine- or even be the engine itself. September 2017: 10B evaluation + 1B revenue. What happened between 2008 and 2010? 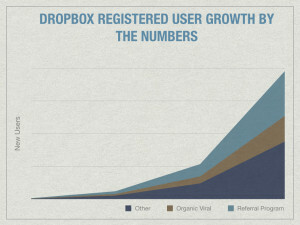 Well, Dropbox managed to double its user base every 3 months, resulting in their users sending 2.8M invites in April 2010. People, we’re talking about a 3900% growth in 15 months! OK, enough with numbers. Let’s get straight to the chase: how did they do it? Obviously, it’s not all due to the referral program; they gathered a ton of feedback, they constantly improved their product and they kinda put a battle in order for VC’s to trust their money to them. Since I’m not the best dude to talk about business development, I’ll have to put this aside and try to explain the factors that put this referral to the pantheon. The philosophy of Dropbox’s referral program was very plain. Since the product offered storage space in the cloud, they decided to reward people with more free space not only for referring their friends but also for accepting an invitation. In order words, we’re talking about a 2-side referral program for a compelling product, that rewarded both sides for completing the desired task; registering for Dropbox. 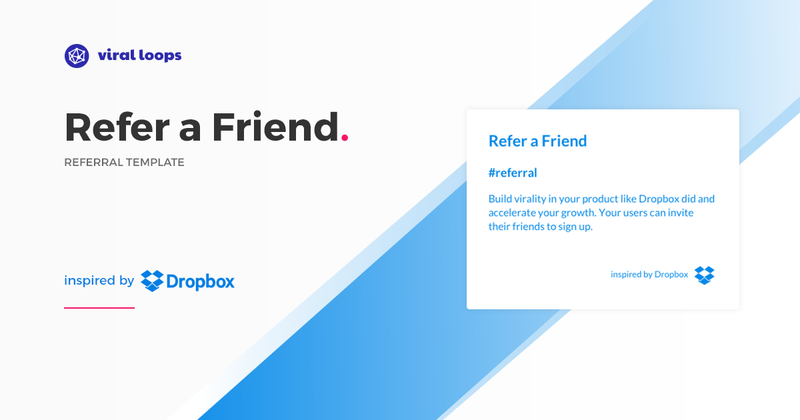 We provide the easiest way to build a referral program inspired by Dropbox. Onboarding users can be such a pain. When people go on to start using a software or a service, they expect they’ll have to fill out some details. I don’t know about you, but when the onboarding process of a product I’m dying to use is easy, a smile carves my face. Just like saying ‘thank you’ by offering more of the product. According to Dropbox's founder/CEO Drew Houston, Dropbox's referral program got inspired by Paypal refer-a-friend program. Paypal rewarded referrals with cash (as this is what their business was about), so Dropbox had to use their product's main value in their rewarding system. When someone decides to use a product, they exactly know what they want from it (whether they get what they expected or not is another story). In Dropbox’s case, people wanted cloud storage; the more, the better. I get constantly asked what is one of the top 5 skills in marketing. I’ll be damned if copywriting is not one of them. Because context beats content. 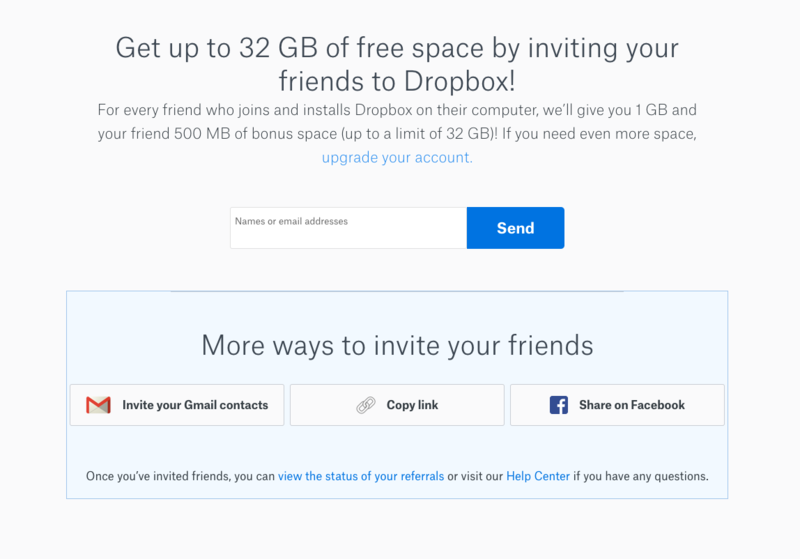 That’s why instead of ‘Invite your friends’, Dropbox framed the referral as ‘Get more space’. After the user got hooked with ‘getting more space’, the next step was to make it as easy as possible to get it. It was clear that they had to bring their friends on board. But here lies one of the best invitation hacks I’ve ever witnessed. Email is powerful, but sending your invitations to your contacts one by one isn't so, Dropbox offered the option to sync your contacts from Gmail, AOL, Yahoo!, etc. If you’re planning to create a referral program, listen to me; and listen to me good. You want to push users to make enough referrals in order to attain a prize goal. The easiest way is to make it visible to them how close they are to attaining this goal. I see this in a lot of referral campaigns; I complete the steps, invite my friends and then...Nothing! No notifications or no email, informing how many of my friends actually successfully registered from my referral link. This is a huge mistake, people! Dropbox included a panel that was accessible anytime by users, so they can see how the invites performed. 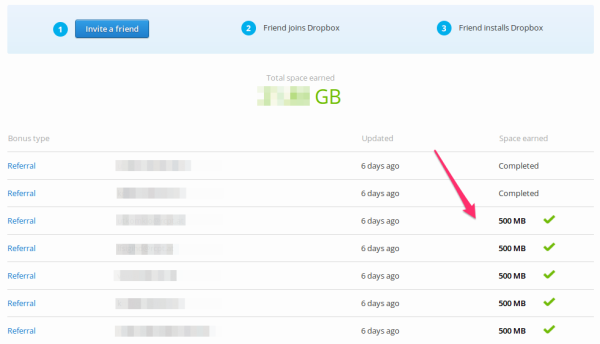 I became a member of Dropbox from a referral (what a surprise, huh?). I received an email from a friend, signed up, and then I received another email informing me that I was given 500mb for accepting my friend’s invitation. “Sweet”, I thought. In the very same email, there was a P.S. 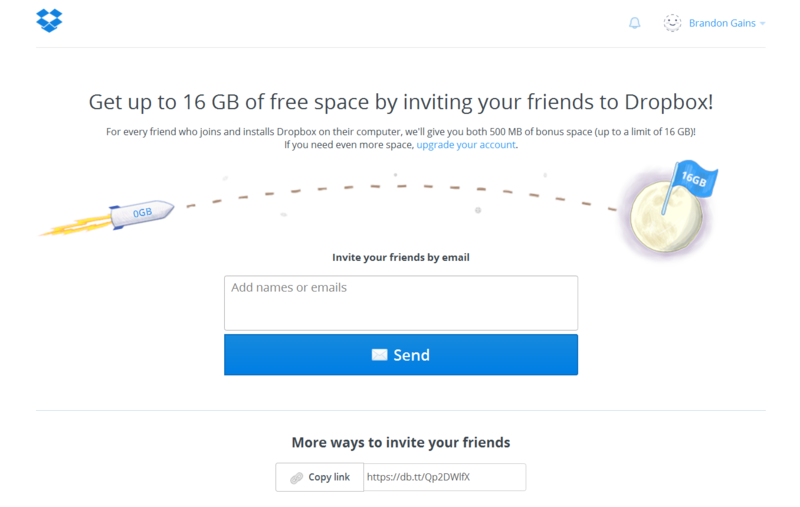 ; ‘To get even more space, invite your friends or upgrade your Dropbox’, with 2 links placed respectively. Dropbox grabbed the opportunity in my WOW moment and offered me additional value by prompting me to get more without paying a dime. Their referral’s goal was to attain a bigger audience reach, not a boost in their revenue. It was a chance to open their funnel in a very cost-effective way by just showcasing their will to offer more for less. Offered an extended version of the same product. It was part of the onboarding process. People had a clear view of the benefits. It made it ridiculously easy for people to invite their friends. People knew their referral status at any given time. They managed to build a Viral Loop. There you have it! Now, I’m going to step back and think what the next addition to the ‘How the hell did they pull this’ series (the name remains totally fictional, but I’ll fight for it). In case you’re interested to build a Dropbox-style referral program, we have your back! Save yourself some time. June 12, 2018 - No Comments! You invite your family, friends—perhaps even your LinkedIn network —to download your app or buy from your store. Despite your efforts, your launch ends up being less “big thing” and more small potatoes. January 4, 2018 - No Comments! Your company hits a wall. The PR shine you once had has worn off. Sales are slowing drastically. And everything you try barely moves the needle. What do you do? Throw in the towel? Ecommerce retailer Gilt faced this very problem. And (spoiler alert!) managed to stop the slide and keep the company alive, resulting in a $250 million acquisition in 2015. We’ll talk about how they did just that (and what your company can do if facing a similar situation). But first...I want you to understand the Gilt story. We need context. In 2007, Gilt launched with a bang. Specialising in flash-sales, 💥 💰 🛍️, this cutting-edge online retailer’s first offer was 50%-off Christian Louboutin shoes 👠 👠. The offer excited masses of fashionistas, nearly crashing the popular new site. 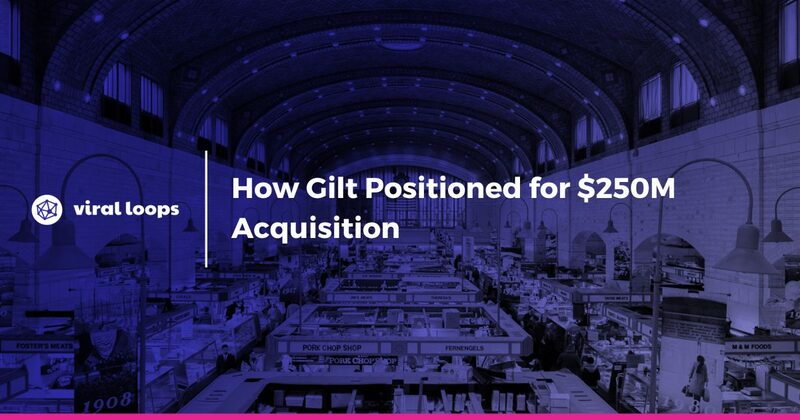 Like many businesses, though, Gilt was not able to maintain the same trajectory of growth they achieved when they first launched. Fortunately, they found a solution. The Gilt Insider is a dual-purposed loyalty programme that would both grow word of mouth sales and increase basket value (or the cost of items in a typical customer purchase). If those milestones sound like something your business could use, here’s a step-by-step guide to making a Gilt-style programme work for you. Before they could solve the dipping-sales issues, Gilt-ers needed to understand what was actually happening. Starting in 2010, Gilt ventured into full-price items in retail, travel and foods, creating new sub-brands for each. They soon discovered that spreading their wings wasn’t such a great idea. When overall sales started to drop off, Gilt leaders knew something had to change. Drop the extra dragging them down. Turns out, keeping customers is particularly difficult for retailers using the flash-sale model. Customers do love 😍 a discount. I mean, really love a discount. In fact, coupons and vouchers, for example, can even cause the increase of oxytocin levels in the brain. 93.8%? That’s pretty much everybody. And no business can survive on the 6.2%. Your key takeaway: Before starting your referral program, clearly define your problem; know what you’re trying to solve. Even though a referral programme helped Gilt, gaining new customers wouldn’t have gotten them over the sales slump. If they didn’t also handle how their brand was brought over-extended, they would likely have not been able to stay afloat. Critically consider the issue (or issues) that may be standing in the way of your success before you proceed with planning your program. A programme is only as successful as its foundation. They can also decide how they use their points, making rewards less one-size-fits-all and more tailored—just like the fashion brands they are offering for sale on the site. With an ongoing rewards-for-referrals model, Gilt can constantly capture referrals, even from the customers who have recently become aware of the brand. More importantly, Gilt retains their formerly one-and-done customers as they keep coming back to spend their points exclusively at Gilt. 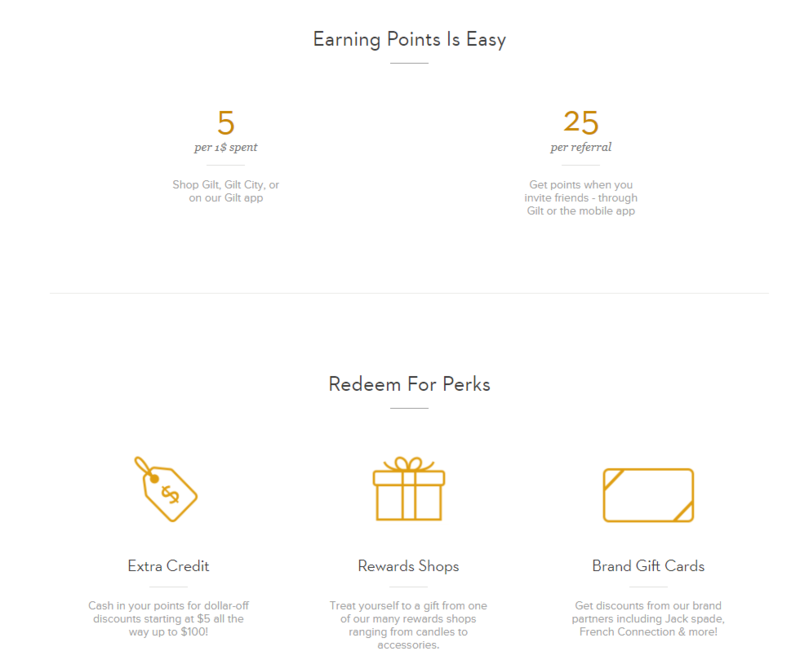 To help customers see how they could use their points, Gilt built a beautiful explainer page. This page shows customers how they can spend their points and earn more. Want to save $20? Start referring your friends, and you’ll get there. Gilt’s success depends not only on recruiting new customers but also on doing something that flash-sale retailers are notoriously bad at—getting customers to come back often. To dissuade customers from going months and months between purchases, Gilt set a relatively short expiration date on their points—six months. If a customer doesn’t make a purchase, his or her entire points balance will expire. The prospect of losing not just some, but all, points is enough to encourage many participants to make a purchase. And, of course, Gilt doesn’t expire these points without warning. They send several, spaced reminder emails to give customers a heads up and encourage them to make that points-saving purchase. Though some would consider selecting a relatively short six-month window risky, with clear reminders, Gilt continues to find success with this model. Your key takeaway: While most loyalty programme experts agree that having a point expiration is an important motivator to making a purchase, the debate remains regarding the ideal term. Your programme’s mission is to give customers and potential customers a reason to act now. Whether you use expiring points or limited time referral offers, you can benefit from forcing customers to stop pondering the purchase and just buy already. As Gilt Insider customers gather points, they also climb levels within this program. Developing a tiered program, with enticing benefits on each level, adds an element of exclusivity. Depending on the number of points they earn, Gilt Insider programme participants can climb to Select 🥉, Premiere 🥈 or Noir 🥇 tiers. Each tier offers its own exclusive benefits, with the most sought-after reserved for Noir members. Noir members enjoy waitlist preference and get a 1-hour preview of new items added to the site—a substantial lead on other competitive flash sale shoppers chomping at the bit. Because tier status is re-evaluated annually, customers have yet another reason to keep on referring and spending, fuelling the continued success of the programme and, by connection, the continued success of Gilt. Your key takeaway: By providing exclusive access, Gilt taps into customers fear of missing out (FOMO) and creates a sense of urgency. Offering something to an elite group of buyers makes other customers aspire to be one of these high rollers. And, if they have enough aspiration, they may just make the purchases necessary to get there. So, do you want to create a referral program similar to Gilt? We've got you covered. 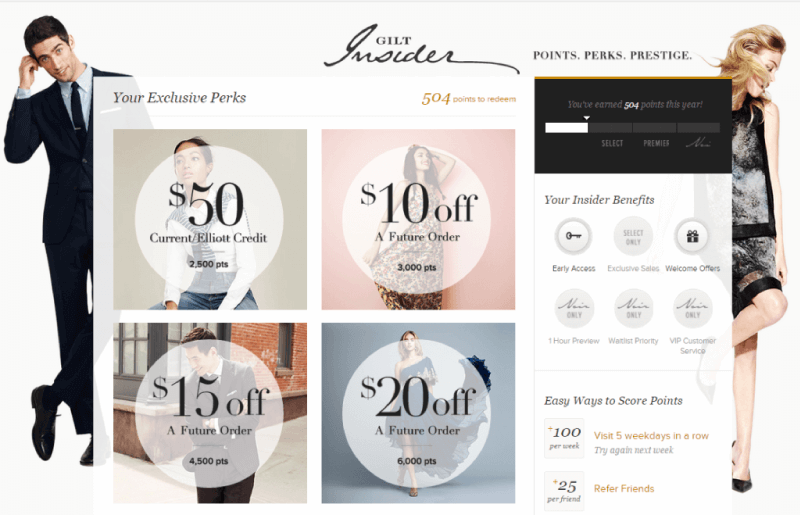 This template is inspired by Gilt and it's the best way to let your store visitors refer their friends. In case you’re interested to launch a referral program like Gilt, we have your back! Save yourself some time. November 3, 2017 - No Comments! Whether you’re heading to an event and need swag for your promo table, or trying to increase brand name recognition, every company’s got a use for swag and could benefit from a well-planned giveaway. But that’s also the problem, isn’t it? Every company gives stuff away. That means, your customers already have a drawer full of pens, tees, squishy stress balls and glossy stickers from the last event they went to. If you want to be different and have a meaningful, memorable, sure-to-keep-your-company-top-of-mind giveaway, then it’s critical you treat the swag process as more than the act of thumbing through a promotional catalogue or website. One company that’s done just that with surprising—even weird—swag? MailChimp. Everything about their brand, in fact—from the cheeky monkey, Freddie (no offence Lil’ Poogy), to their approach to design. If their rate of growth is any indication, we’re not the only ones feelin’ the love. Since the company’s launch in 2001, this self-funded email marketing platform has grown like crazy, gaining 14 million users and reaching $400 million in revenue just 15 years since its launch. While their drool-worthy swag and engaging rewards aren’t the only reasons for company growth, certainly they’ve played a part in building the brand and its reputation. These forward thinkers have created some of the most sought-after merch we’ve seen to date. What’s their recipe for giveaway success? 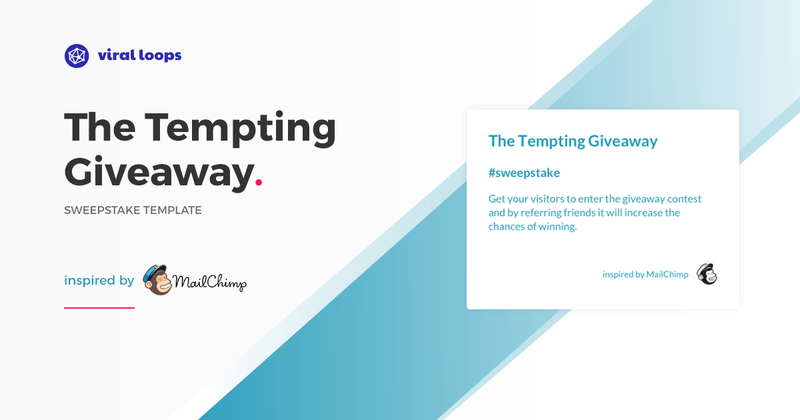 Let’s take a look at these MailChimp-inspired giveaway tips. According to Mailchimp, choosing the right merch begins with thinking about giveaway products from the right perspective. 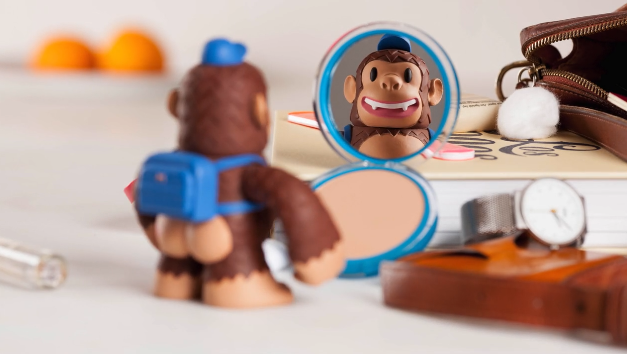 At MailChimp, employees consider freebies less as marketing swag and more as thoughtful gifts. While the Atlanta-based team hopes to yield a return on its investment, they’ve asserted that there’s no way to determine with certainty if the latest MailChimp colouring book, MailChimp windbreaker or Freddie & Mannie stationery picked up at a giveaway table will result in a sale. But it ultimately doesn’t matter, because giveaways are all about the customer experience. Let’s make this idea real: What would you think if you received as a gift the latest piece of swag your company ordered? Or, would you say... “meh” 🤷... instead? If you’d be less than impressed, then why would you expect your customers to feel any more enthusiasm? You already care about your company, but your customers don’t…yet. Endear your customers to your brand by selecting swag that creates this feel-good moment. Because let’s be honest, pens and mugs can be cool. But a monkey pen holder that lives well beyond the life of my Bic pen and sits on my desk for years to come, well that’s so much cooler. MailChimp didn’t have to guess whether customers would think the swag was cool. From assessing the softness of Freddie plushies to ensuring the durability of tote bags, to trying on winter hats, MailChimpers selected and tested each gift with care in-house. To make sure that the treats used to tempt their customers are adequately…well…tempting. Their merch is so tempting, in fact, that people have begun to collect MailChimp swag—some even willing to buy MailChimp merch that may have once been free. In their nearly two decades, MailChimp has done quite a lot of memorable stuff—but almost nothing quite as notable as one particular giveaway. And no, we’re not joking. 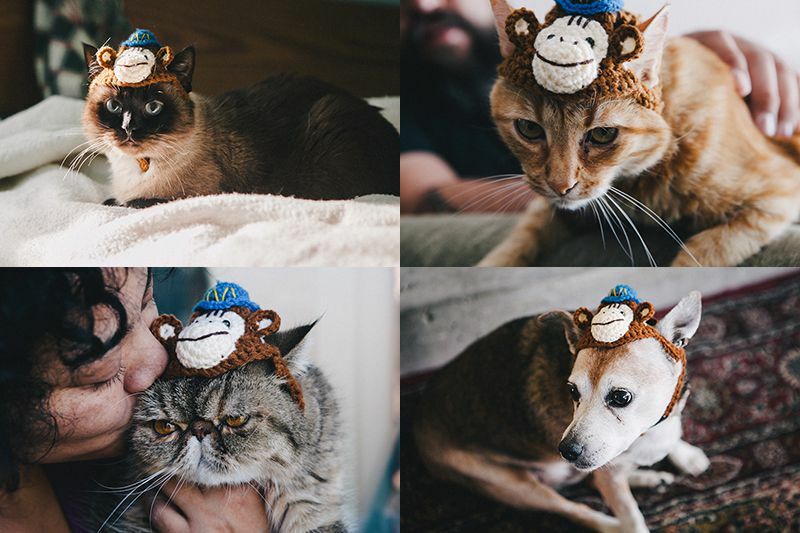 In a killer contest, which ran in November of 2012 on Facebook, MailChimp offered participants crocheted hats for cats (and tiny dogs, too). All a pet-parent needed to do to earn a chance to win one was to sign up for MailChimp’s email list. This ingenious event was the perfect storm of giveaways, bringing together both the already viral nature of cats and people’s love for their pets and need to post pet pics on social media. It became a viral campaign—cat video included. The result? Tons of hats for a ton of cats needing to be sent all over the world. Who’s gonna handle manufacturing and logistics? Fortunately, MailChimp figured this out before they promised to deliver feline headwear. By partnering with manufacturing and fulfillment company Amplifier, MailChimp prepared to deliver on promises. They gave customers what they said they would give them, when they said they would give it to them. MailChimp valued Amplifier so much that they considered this company their secret weapon, keeping their relationship secret for quite some time so as to not lose their competitive advantage. We’ve all seen those annoying sweepstakes spam pop-ups. And then there are the social giveaways that ask you to follow 5 different people, comment on a photo, tag three friends and send in your email address. I don’t know about you, but the prize would have to be seriously awesome for me to go through all of those steps. If you want your customers to participate (let alone remember you), you need to give them something memorable, delivering your giveaway in a decidedly distinctive way. That’s exactly what MailChimp did when it gamified its Freddie squishies giveaway. Website visitors enjoyed an interactive landing page, full of animated objects, that encouraged them to search through the items, looking for the hidden prize. Only when they found the reward and clicked on it could they enter. 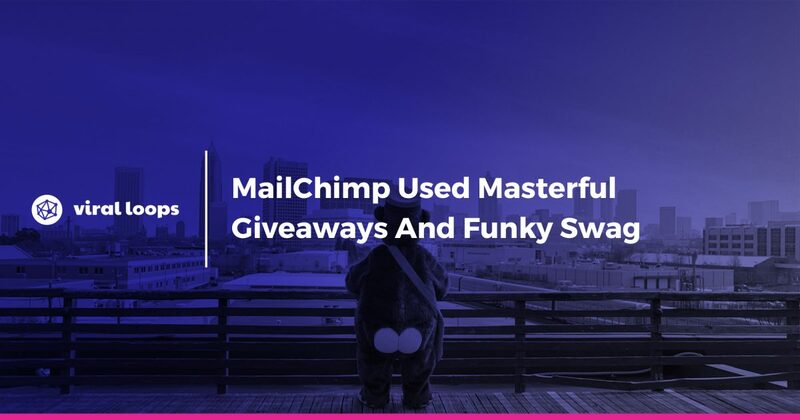 Giveaways and swag helped MailChimp become the inbox dominators they are today, but that feat wasn’t achieved simply by the acts of running the giveaways and handing out the swag. It’s the way in which they approached, planned and implemented these promotions that’s made all the difference. So, do you want to create a campaign similar to Mailchimp? We've got you covered. This template is inspired by Mailchimp. People can join your competition, just by putting in their info. You give them the chance to increase their chances of winning by referring their friends, every friend is one entry. 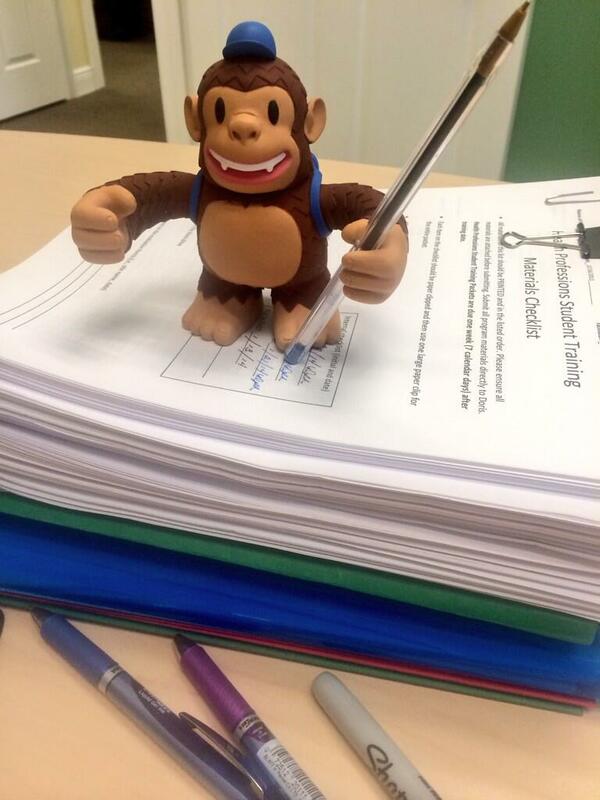 In case you’re interested to build a giveaway like Mailchimp, we have your back! Save yourself some time. October 20, 2017 - No Comments! Would Someone Spend $18,000 to Win Your Contest? Jet Made it Happen. Whether it's a game of football or who can finish a beer first, I’m in it to win it. But even my competitive streak has never driven me to invest $18,000 toward winning a contest. I mean, that’s how much a brand-spanking-new 2017 Honda Civic 🚗. would run me. So needless to say, when news of a man who shelled out this much cash for a chance at winning a Jet.com referral marketing contest crossed my desk, I was intrigued to say the least. Who am I kidding 😲 ? I questioned his overall sanity. And I wondered what in the heck this company had offered to inspire him to spend the equivalent of two years of uni tuition. The short version is this: Before its launch, Jet.com (a startup wanting to compete with Amazon.com) ran a growth hacking contest. Besides the fact that some guy invested $18k securing a win, Jet.com gained a quite the number of “insiders,” which most certainly contributed to their later multi-billion-dollar acquisition. Could you copy this model and inspire that kind of investment from your referral marketing participants to grow your business—or perhaps come even just a little close? It may not be as difficult as it seems. 1. Give the people what they want. Jet.com knew that the only way to ensure a strong launch was to build some online buzz; and what better way to do it than to hold a contest? But this wasn’t your run-of-the-mill giveaway offering free product, swag or a cash prize, Jet.com decided to tempt participants with something more valuable—shares of their business. And they weren't just giving away a share or two... they were giving away 190,000 shares spread across 10 winners. 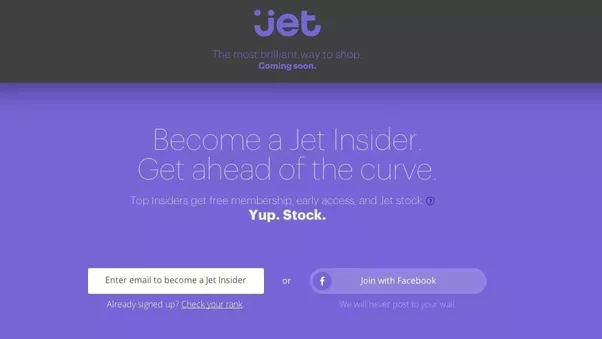 At the end of the contest, the winner earned 100,000 shares of Jet.com stock (no, that wasn’t a typo. I said 100,000 shares). Participants in places 2 through 10 received 10,000 shares each. Ok, so you might not have 190,000 shares of your stock you want to part with. But the takeaway here is that you must give participants something of value. Logically, people are going to put more effort into your contest if you are offering something they actually want. A free t-shirt is nice, but not many people are going to invest much time or energy for a chance to win a shirt to add to their probably-already-overflowing drawer of tees. So don’t just copy your competitors. Think outside the box (📦 🕺) and offer something that hasn’t been done before. 2. Show participants their progress along the way. What did contenders have to do to add these shares to their portfolios? Simple. Get people to sign up as a Jet.com Insider. At sign up, each contest participant received a unique sign-up link so that Jet.com could attribute referrals. Participants shared these links with friends and promoted Jet.com’s insider program on social media using their unique links. People hoping for a win didn’t have to guess as to how they were doing. There is a reason stadiums have a scoreboard, after all. In this same vein, Jet.com provided regular email updates to content participants showcasing their place on the leaderboard. 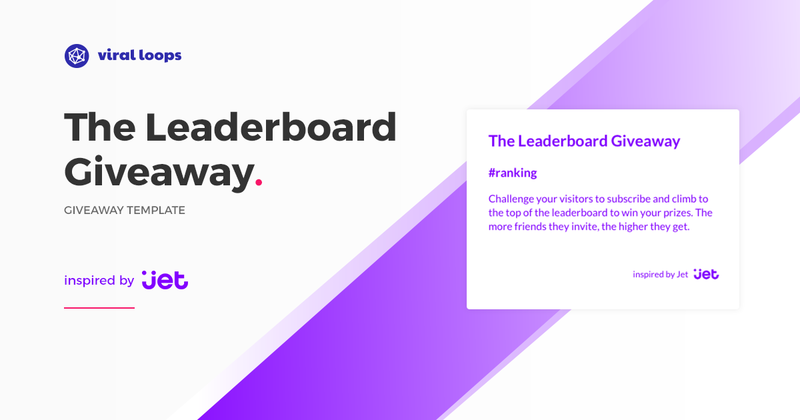 A virtual leaderboard—a sure way to motivate the competitor in all of us—tracked those with the most referrals, specifically, the top 10. By feeding their referrers a steady diet of data, Jet.com empowered those racing for the top spots, keeping the contest alive day after day. Follow Jet.com’s lead and give your participants information on how well (or not well) they are doing. Your ultimate goal is to get as many leads as possible. By reporting your referral program competitors’ progress, you encourage those going after the prize to ramp up their efforts, in turn ramping up your lead list. 3. Get the word out far and wide. 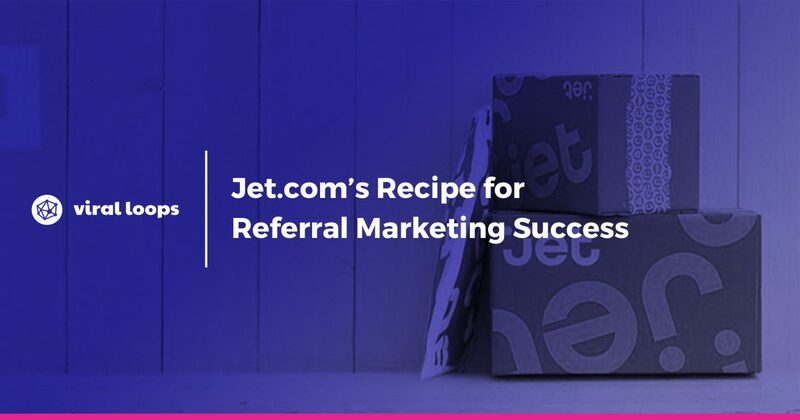 When Jet.com launched their referral program, they managed to obtain some serious media attention, which worked out to their advantage. The man who ended up winning those shares learned about the program when in a Bloomberg Businessweek article. 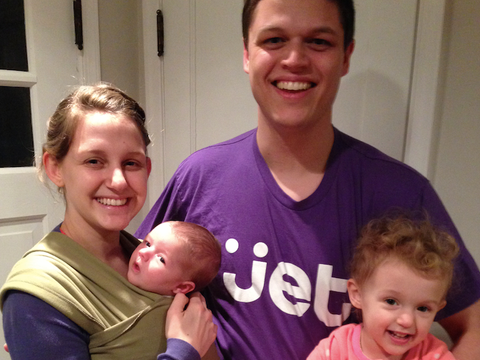 By getting the word out, Jet.com managed to catch the attention of their contest winner—father of two, Eric Martin works as a product specialist…or I should say, worked. He also ran for Congress in 2012, but his run ended in a disappointing 5th place finish Republican primary. 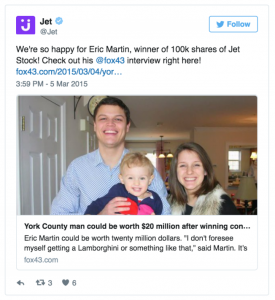 Martin heard about the Jet.com contest and entered it late in the game, starting in January despite the fact that the contest had been going on since November. In the case of Eric Martin, it wasn’t slow and steady wins the race. It was, instead, pretty much the opposite of the Tortoise in the Hare. In just three weeks, he signed up 8,000 people by investing 18K between Facebook advertising and marketing the promotion on Swagbucks.com and GiftHulk.com, giving him the #1 spot on Jet.com’s leaderboard. Posting your program on your website and social media channels and hoping for organic traffic isn’t going to be enough. Pay to play with boosted social posts and traditional media to spread the message and get the attention of a larger crowd. You can’t just depend on an “Eric Martin” finding out about your promotion accidentally. So how did Jet.com make out in the end? And what about Eric Martin? At the end of the day, the referral program model worked out pretty sweet for Jet.com. Yes, they gave away 100,000 shares 💰, but they ended up getting what they wanted – a strong customer base. 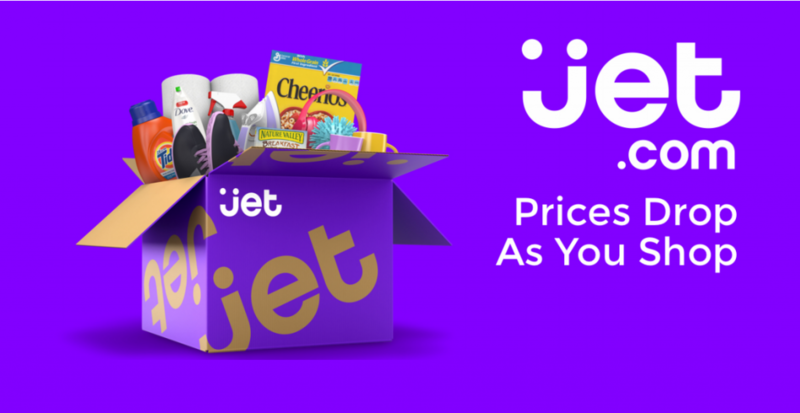 Before they even launched, Jet.com had amassed quite the collection of customers — 350,000 to be exact, thanks in large part to their referral program. The company had some hiccups—they had to give up on charging a $50 membership fee three months after launching, for one—but it looks like it worked out pretty well for them. Their big payday came when Walmart.com bought them for $3.3 billion in early 2016. And in case you were wondering, Eric Martin himself is still at it. He won 50,000 shares of investing start-up Nvstr in May of 2017. So, do you want to create a campaign similar to Jet? We've got you covered. This template is inspired by Jet.com. People can join your competition, just by putting in their info. Then, the more friends they invite, the higher they climb up the leaderboard. In case you’re interested to build a giveaway like Jet.com, we have your back! Save yourself some time. Last week, I wrote a thorough article considering my experience with The Hustle’s milestone referral program. I like this article, but I feel that there is more into milestone referral programs than just an example. Harry’s is a New York-based grooming brand that manufactures and sells shaving equipment via mail order. The idea for the campaign was built by Jeff Raider & Andy Katz-Mayfield, Harry’s founders. Their belief that the most powerful and effective way to launch their grooming brand was through a credible referral. Thus, they focused on building a campaign that helped people to spread the word to their friends—and not just spending a ton of money on Google and Facebook. They managed to gather 100,000 emails in a single week. I want to write that again. 100,000 emails in a single week! Where this pre-launch campaign led Harry’s? Well, initially it helped the company get 100+ million dollars in funding and eventually buy a 94-year-old razor blade factory. This way they could produce their own blades, taking on shaving heavyweights, Gillette And Schick. Also, their team now has more than 500 employees and their digital store is one of the fastest growing in the industry. Apart from that, Harry’s owns its own barber shop in NYC (which I’m dying to visit). The cherry on the pie is that they’re publishing their own magazine- Five O’ Clock. Love it! Can I tell you a secret? This referral was one of the reasons we decided to start Viral Loops. 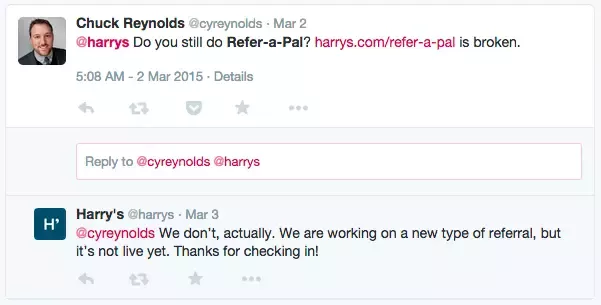 By the way, we created a free tool to help you you build a referral campaign like Harry’s in 4 simple steps. So, how did Harry’s get so famous?! I think the answer here is simplicity. Even a child that was capable of reading could easily be part of their referral. The website of the campaign was something really simple, yet catchy and effective; just 2-page microsite. 1. 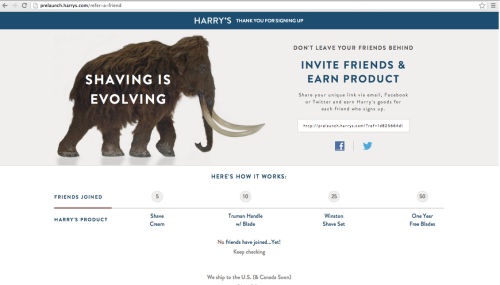 When people landed to harrys.com, they were asked to give their email in order to participate in the campaign. The big bold image made pretty clear to people what Harry’s is all about in the first 5 seconds. That, along with the nice tagline sparked the notion that Harry’s is launching soon and will disrupt the industry (‘respecting the face and wallet since like… right now’). According to Jeff Raider himself, these words were intended to be playful and introduce people to the purpose of their brand and also create an air mystery as to what they were all about. They paired the line with a photo of one of their razors, but they included no more information about their company or product. One thing that I would surely do if I were in their shoes, is that I would also allow people to join the campaign with Facebook login—which would give them more data and also increase conversions. Younger people are not keen on checking their emails constantly. 2. After giving their email, people had to invite their friends to get the prizes. 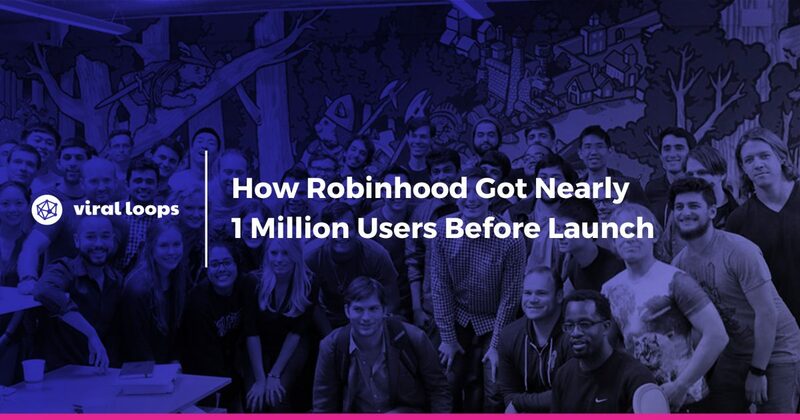 The page included the unique URL of each user, a brief explanation of how the program works and a tracker where people could see how many friends they had referred and what prize they had attained. Harry’s followed the concept of a “Milestone Referral Campaign,” meaning that when people reached a specific number of referrals (milestone), they instantly win the corresponding prize. Their clear messaging: "Invite friends to earn product. ", along with the fact that attaining a prize was super doable (who doesn’t have 5 or 10 guys that shave? ), skyrocketed the sharing count. According to Jeff Raider, Co-founder and CEO of Harry’s, the referral mechanics were amazing. 77% of the emails were collected via referral, meaning about 20K people referred about 65K friends. This means referrers, on average, referred more than 3 friends. Yet there were a lot of people who referred well above that average: More than 200 participants referred more than 50 of their friends, achieving the highest tier reward. In their case, Harry’s did the exact same thing that The Hustle did; they focused on email. All employees handed their email addresses (that was crucial as the first announcement about the product, went straight to people that were known to each other; you can’t ignore an email from a friend), and set their email signature properly. The recipients received a personalized email in a very friendly tone of voice, announcing that Harry’s is coming. In the same time, the copy encouraged people to spread the word. Apart from that, there was a ‘special’ batch of people (like company CEO etc) that receive emails crafted accordingly in order to incentivize them to share the message with their entire team, or company. Can you do it like Harry’s? I think it’s clear enough that this type of referral campaigns is perfect for eCommerce Stores. So if you own one, then the rewards can be your own products and coupons. Also, if you’re in pre-launch, want to just build an amazing referral program, this is a thing for you. This is awesome for blogs, too. You can use it for email list building and give merchandise, like stickers, t-shirts, etc. I think the only thing that stops you from doing it, is the will to do it. For the rest, we’ ve built this milestone referral program tool, inspired by Harry’s that will help you setup your campaign in minutes. Be introduced to some of the most important techniques for making/going your campaign viral. Get your questions about referral marketing answered. Get a bonus offer we have at the end for tailor-made success calls. July 14, 2017 - 1 comment. I love the Hustle. I mean, I had years to read news that look so slick. In the beginning, there was a link that a friend sent me. I clicked; ‘that’s some good copywriting right there’, I said. ‘I dig the branding, also’, was my next thought. Then I received an email from Sam Parr, giving a warm (and rather funny) welcome to their ‘crib’. As far as I remember, after 1 week, and pardon me if I’m wrong, I receive another email. This time, it was an invitation to The Hustle’s milestone referral program. I followed the link (of course I did) and got my mind blown away from the awesome swag they offer in exchange for referrals. I started a referral spree. My eyeballs turned into dollar signs. I had to know how they did it. I googled every relative term, just to find that there’s no secret to their success. It’s all there. How a milestone referral program turned happy readers to fanatic ambassadors. It’s pretty obvious that the folks at The Hustle take their content seriously. They serve emails that you can’t afford not opening, and their articles are informative with a very specific tone of voice. These facts alone are enough to keep people coming back, but what do you do when you want to acquire more readers at a fast rate? How about asking your happy readers to talk about you to their friends, in exchange for exclusive swag? Harry’s used the exact same approach some years prior, resulting in a huge success. A milestone referral program that kicks a$$. As the importance of copywriting and email marketing have already been covered in hundreds of thousands of articles, I thought that it would be wise to focus on the milestone referral on this article. An email from Sam Parr. The landing page for their milestone referral program has a rather plain outfit. You can access it anytime from a link to their website’s footer. The landing page includes some text that explains how the Hustle’s readers sculpt the face of the company, and a single Call-To-Action asking you to join their ambassador program so you can help them become even better. I didn’t become an ambassador from this page. As you can see, I was given a unique URL to share with my friends. Every new email address the Hustle obtained thanks to my sharing, added to my referral count. Since building a community is obviously important to the Hustle, the first tier was to bring 4 friends in order to get access to a private Facebook group. That way you get the opportunity to introduce yourself and engage with the other people of the tribe. You can always use your unique URL to track the number of your referrals. And that’s where the magic happens. You see on this page, there’s a showcase of all the prizes you can unlock depending on the number of referrals you have. I think that just by looking on this page with the number of referrals and the gifts acts a superbly strong call-to-action for sharing more and more. This is the greatest trick of all. The Hustle is very much aware of it. That’s why every now and then, their emails aim to lure you back to that page. People are full of doubts. We’re constantly afraid that we’ll fail (which, btw, is very natural and you should probably get used to it). Fear could discourage people from sharing, due to their low expectations for the outcome. That’s why the page also includes tips on how to share for more referrals, along with some stories of how some top ambassadors made it. You can find more stories like that in the Hustle’s FAQ page. Let’s say you unlocked the prize you wanted; what happens next? First, after you reach each milestone you get an email (of course) informing you about your moment of glory. You are given the option to cash out or keep your referrals for a bigger prize. If your choice is to cash out, you’ll have the postman knocking on your door after a few days. Your prize will be enclosed in a branded package, along with some extra goodies and a handwritten card. 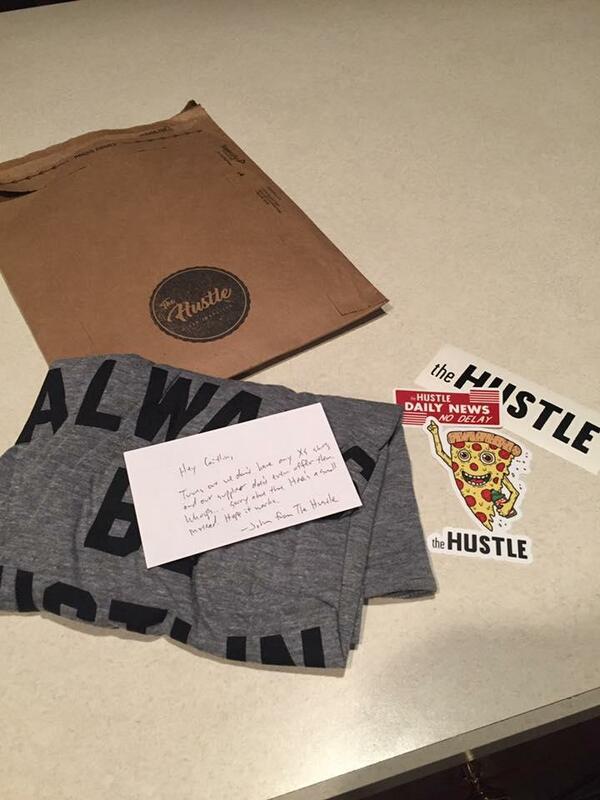 Are you thinking of building a milestone referral like the Hustle did? I know that stories like the Hustle’s fascinate you- that’s why you read everything so far. I also know that you consider building your own milestone referral program. You don’t need any coding skills or to hire a developer. We got your back. Recently, we created a tool, to help you build a milestone referral in 20 seconds. Seriously; 20 seconds. Use extraordinary copywriting. It’s your chance to shine like a diamond among coals. Build a community for your ‘tribe’. An engaged community is priceless. It might take a lot of time, engaging, posting and approving people, but it’s totally worth it. Offer prizes that align with your company’s brand identity. The Hustle is all about having swag; that’s why they offer swag. 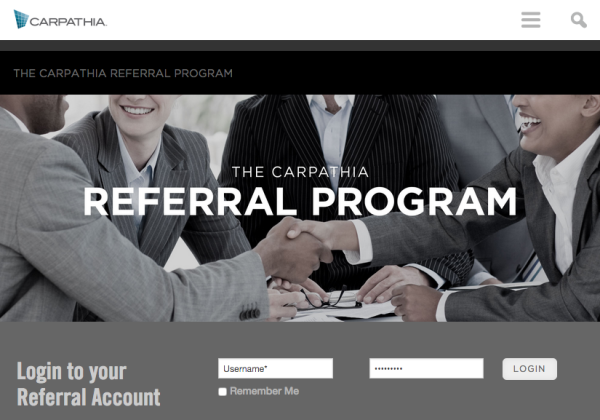 Incentivize people to come back to their referral page. Help people to get more referrals. I told you, people are full of doubts. Now, you are truly ready to build your own milestone referral program. Give it your best, and who knows? Maybe my next story will be about how your ambassador program knocked my socks off.